and snow-globe collections that once hid in the corner of your room under that pile of need-to-be-washed boxer briefs. 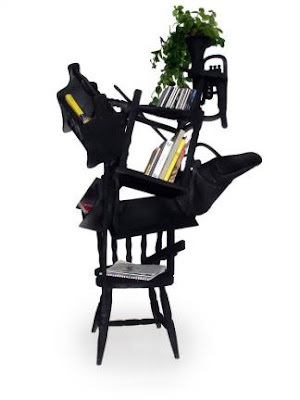 It’s made from four large (4-liter) empty Carlo Rossi jugs, 24 small (1.5-liter) ones and simple hardwood shelving. White neon tubes give it a glow that will make even celebrity gossip rags look scholarly. Enjoy the wine. 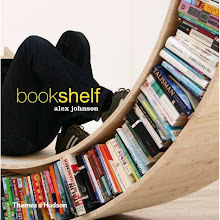 Enjoy the bookshelf. Just don’t mix the two. 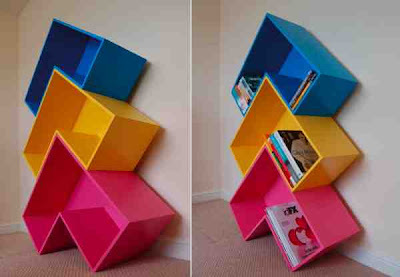 A bookshelf with sloping shelves by Renouveau. 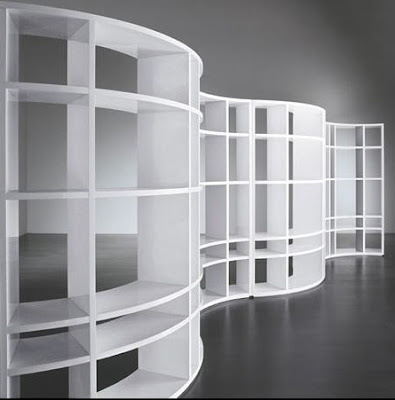 Designed by Massimo Iosa Ghini as part of his "biosphere" series, the DNA bookcase is available in chrome and gloss painted aluminum. 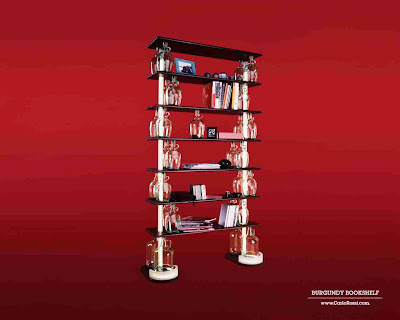 Shelving is black or beige lacquered wood. 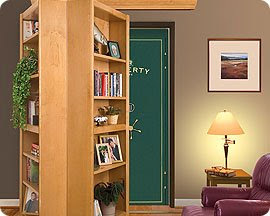 Bookcase must be attached to wall. Dimensions: 67" ht, 56.7" width, 12" depth. 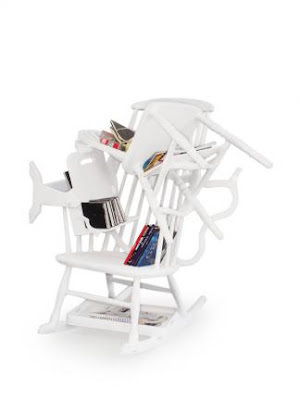 Shelves vary from a minimum of 13.4" height. Size: H 48 cm, L 100.9 cm, Dept 10,5 cm. plåt, svetsade skarvar och sprutlackerad. som lyser i uv ljus. whit fluorescent green that’s shine in blacklight. 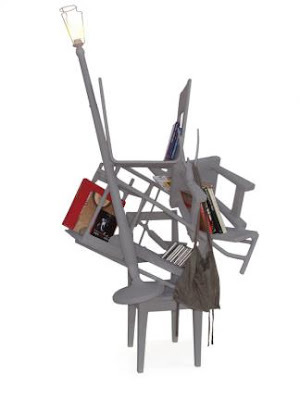 Suzan:A sculptural archetype in furniture, bringing a bold statement of functional art into your home. 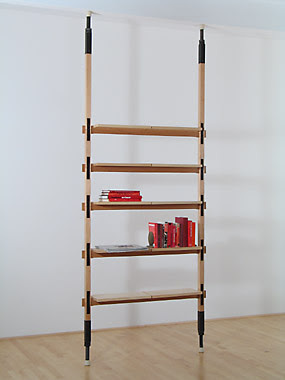 Bookshelf made from rolled sheet steel, finished in a tough powder-coat. 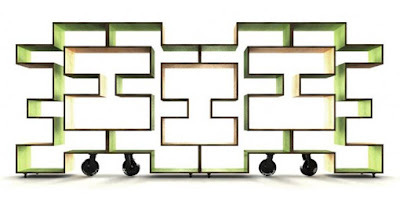 Omar: I decided to design a shelving and console table reminiscent of an Arabic style, a tribute to the passion and creativity of Middle Eastern culture, while using materials and processes which are Western in technique, production and finish. It is also inspired by the classic Candelabra which has been a beacon of light and a detail of sophistication in many a European household. 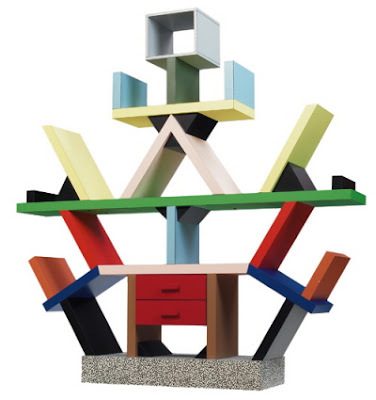 Each piece is a sculptural archetype in furniture, bringing a bold statement of functional art into your home. 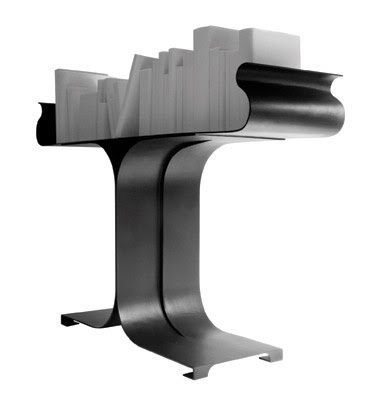 Console made from rolled sheet steel, in a tough black or white powder-coat. Rather than lining your walls with books, the books are the wall. You can't have too much book space. Period. Goes anywhere. And the five shelves hold all your reading material while touching the ceiling and floor on only four white rubber feet. Now available in two widths. 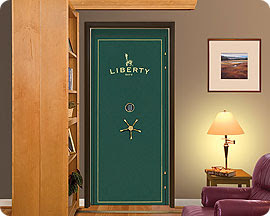 Dimensions: 25 1/4" x 8 3/4"
height: specify up to 12 ft. adjusts to 5" more or less than height specified. 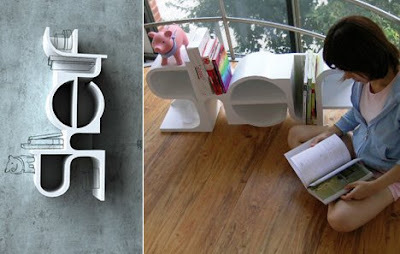 Brickshelf is based on the simplest kind of bookshelf: brick, shelf, brick, shelf, etc…the transformation of the shape of the bricks into the shape of abstracted books makes the bookshelf to become a beautiful and friendly object, without complicating it. As the “books” are produced by extrusion, the same production run like bricks, they are available in different heights. 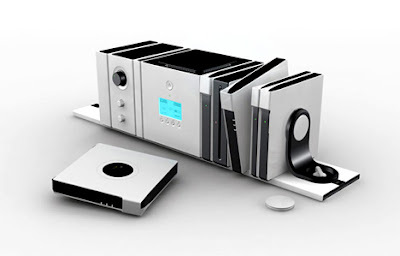 The personal computer physically resembles a bookshelf and functions like a bookshelf as books and magazines – or in this case, hardware – are placed on it. The foundation of the computer is its central processing unit, which is a 7-inch cube. 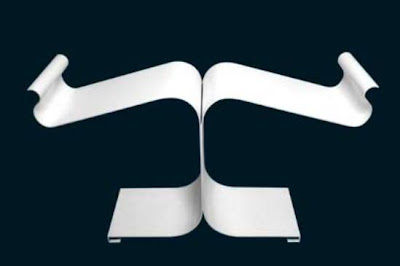 The Bookshelf operates with add-on hard drive attachments that are supplied by digital service providers so they can protect copyrights while still accommodating user convenience and portability. 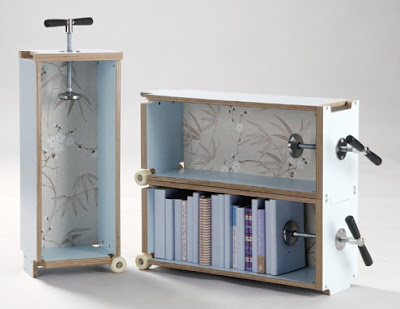 The hardware attachments – containing multiple movies, games, or magazines – will vary in width, but its other dimensions will be the same as the Bookshelf cube. 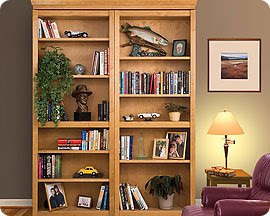 As the hardware attachments are added, the Bookshelf becomes its own multimedia library custom-built by its owner. For example, users can watch movies by connecting to a television or computer monitor. 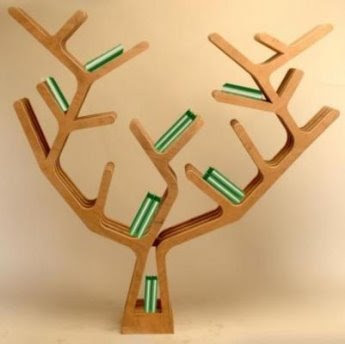 Design: Johannes Herbertsson & Karl Henrik Rennstam. 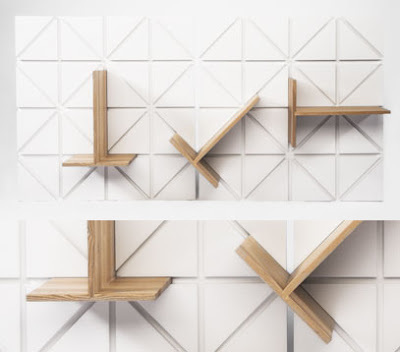 A modular shelving system made from MDF and ash, featuring a wall mounted modular block and easily detachable shelves that require no fittings. The nature of the design allows for various combinations and compositions of shelves, allowing the user to create their own bespoke system. 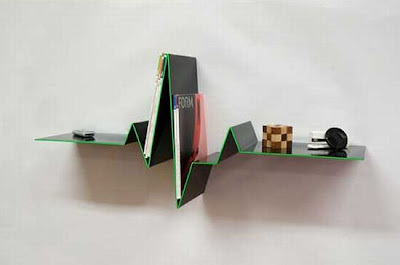 The design has strong roots in the language of graphic design and functions as a both shelving and a visual wall display. 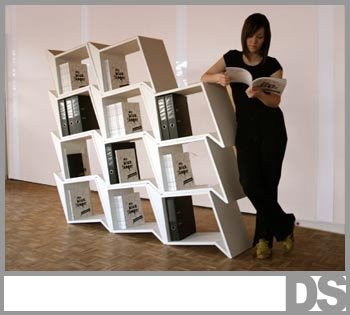 Alog shelving provides a playful solution to storage requirements with simplicity of use built in. 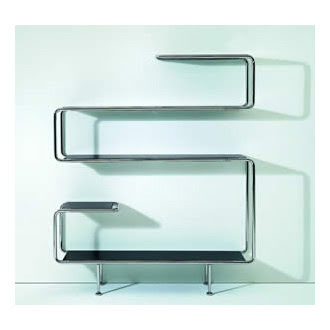 Measurements: 648 x 648 mm, Shelf depth 200 mm. 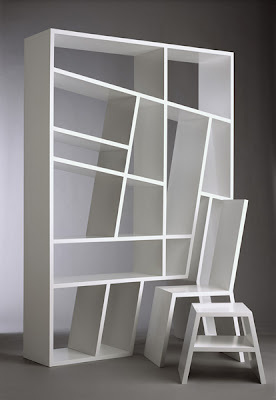 Shelf, which can be used as a solitary shelf or which can be combined with additional Libri shelves alongside against the wall, back to back thus becoming free standing or several shelves in a row out from the wall creating a room divider. 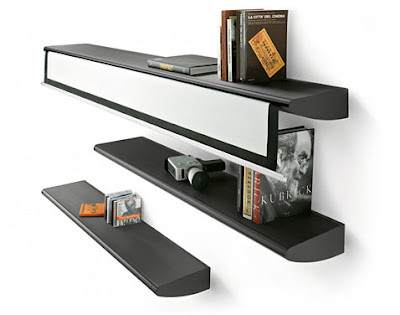 The Libri shelf has adjustable legs, that can be adjusted also after the installation. 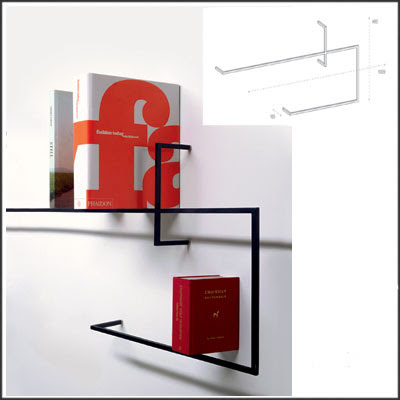 Brackets for installation against the wall, and for linking between the Libri comes with each Libri shelf we deliver. Material: White or black lacquered ash wood. 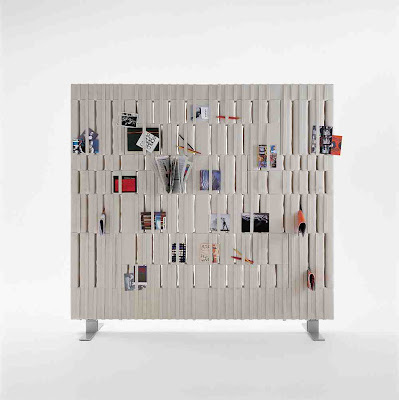 A modular bookshelf which satisfies all wishes: easy to set up, extendible to any number, to position freely as well as on the wall, light in weight and big enough for standard folders. Furthermore a module is more than a rectangular box: an ornament which forms a graphic pattern and thus decorates your living space. multiplex, hardsteen 30 x 50 x 234 cm. Een flexibele constructie van 4mm dik multiplex. Alle onderdelen zijn los met elkaar verbonden. Onbelast staat de kast rechtop. Naarmate hij meer belast wordt buigt de kast door naar een kant. 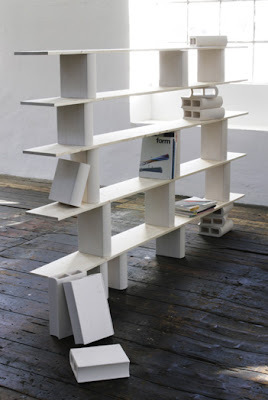 A strong contender for this year's Turner Prize, Olof's work literally deconstructs the bookshelf and reduces it to its most basic architectuality, a primitive pile.